Do I Detect The Seeds Of Another Canvey Petition Protest? IT SEEMS THAT Canvey Island Town Council, under the new chairmanship of CIIP member John Anderson, are now about to spend more residents’ money in obtaining the views of islanders regarding a pedestrianised shopping precinct in Canvey’s town centre. Not content with wasting £180,000 on Canvey Lake, which is in any case earmarked for improvements under the Town Centre’s regeneration plans, the Town Council has apparently decided that the 3,687 participants in the public consultation process do not reflect islander opinion. They are certain that, given the opportunity, islanders would choose a pedestrianised High Street as opposed to wider pathways; cycle tracks; and a two-way traffic system to overcome the present congestion problems. Indeed, it seems that congestion – whether it be island traffic or just petulant opposition to any modern progress – is the Town Council’s stock-in-trade. They have had the opportunity, since September last year, to promote their own ideas regarding the town centre’s regeneration; but instead they have, as usual, waited until the last moment to criticise the consultation process and infer that the developers have it all wrong. 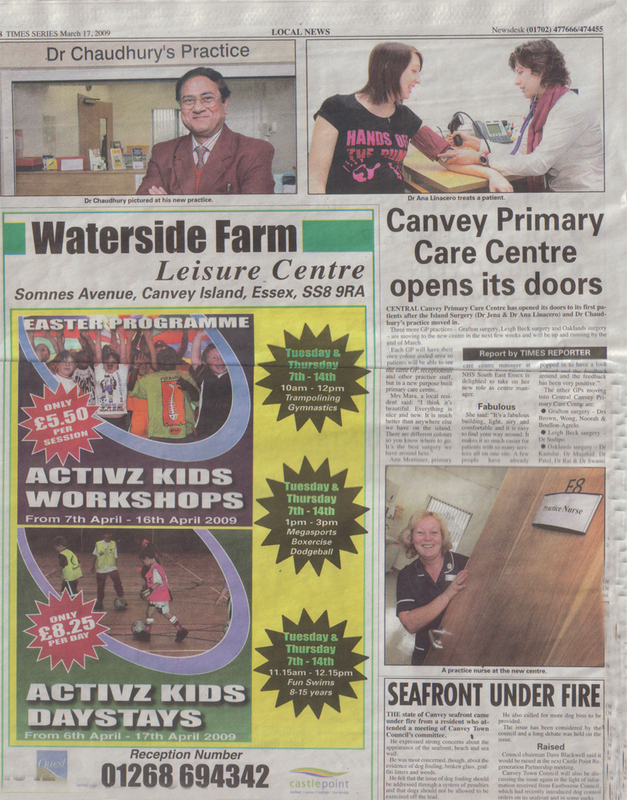 True to form, the local Echo has taken to providing its column inches to the Town Council’s view – with no coverage of the alternatives that the visitors to Canvey Island’s Regeneration Shop have had the opportunity of choosing between. Furthermore, the Town Council is not urging residents to visit the Regeneration Shop to make their views known, they would rather just pose a simple question to residents – rather than give them the opportunity of making an informed decision. The Town Council’s proposed opinion survey is heavily weighted against the developers. 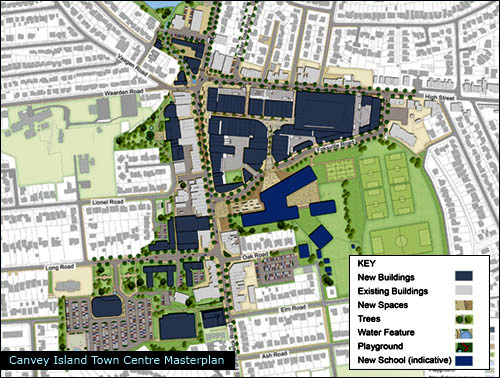 Most people, asked if they would like to see the Town Centre pedestrianised – and given no alternatives – are likely to say, ‘Yes.’ A fact that is not lost upon the Canvey Island Independent Party (CIIP), which has a reputation for taking arguments out of context and then organising petitions around them. The protests over the Concord pool and Kismet Park’s Adizone have since flowered and gone to seed; but the CIIP is determined, in this the Town Council’s election year, to create another local issue that it can use to retain its political foothold. YESTERDAY EVENING’S Cabinet meeting had two surprises in store: an admission by a Canvey Island Independent Party member that the borough has a housing problem, and the reported support of Canvey Island Town Council (CITC) for a cabinet proposal to introduce a borough-wide dog fouling scheme. (The Town Council has, of course, been endlessly debating its own costly proposals regarding dog fouling on the island, which have been heavily criticised). Unlike the Town Council’s proposals, however, Castle Point will enforce its scheme using current personnel and introducing maximum fines. Officers undertake the necessary consultation and report back their findings prior to Cabinet determining whether to recommend to Council to proceed with the making of the Dog Control Order. Castle Point Borough Council (CPBC) is obliged to consult with CITC on its plans. Cabinet member and Town Councillor, Ray Howard, spoke of the Town Council’s strong support for the measures proposed, which were carried unanimously. Cllr Jeffrey Stanley, cabinet member for Corporate Policy Resources and Performance, provided a detailed assessment of the important Housing Revenue Account reforms, enacted by the previous Labour government and now under consultation. Unlike the present situation, where the difference between rent income and maintenance costs disappears from the Borough to assist other local authorities with poor housing stock – and 75 percent of any revenue from tenant home-purchase is paid to central government – CPBC would be able to retain all those funds to build affordable housing of its own. However, in order to ensure poor local authorities are not disadvantaged, the Borough would need to take-on a central government debt of £33.9 million – to be repaid over 30 years. The proposals would not provide CPBC with the ability to meet its own housing needs; but would go a short way towards it – perhaps providing enough funds to build some six units per year. The vast majority of the borough’s affordable housing would still need to be met by local housing associations and private developers. Surprisingly, Lee Barrett, of the CIIP, took time-out to attend the cabinet meeting and speak in favour of the proposal. He read a prepared statement in which he accepted the need for more affordable housing and, in his personal capacity as serving on the Audit Committee, provided his support. It is the first time, to this author’s knowledge, that a CIIP member has ever formally accepted the need for additional housing in the borough – or address the financial issues involved. It was agreed to note the report’s contents and approve the draft responses to the consultation. Steve Rogers, Head of Regeneration and Homes, addressed the Coalition Government’s changes to PPS3 (its Planning Policy Statement regarding housing). Under the new PPS3, private residential gardens have been excluded from the definition of ‘previously developed land,’ and the national indicative minimum density of building 30 dwellings per hectare has been deleted. However, he continued, local authorities are still expected to demonstrate the extent to which their existing plans identify and maintain a rolling five-year supply of deliverable land for housing. So it continues to be the case that CPBC needs to ensure that plans demonstrating a five year supply remain in place. His explanation made clear the reasons why Cabinet was still obliged to present its Core Strategy for approval by the government inspector. On 27 May 2010, the Secretary of State for Communities and Local Government wrote to Council leaders highlighting the new Government’s commitment to rapidly abolish Regional Spatial Strategies (RSS) and return decision-making powers on housing and planning (including housing supply and the provision of travellers sites) to local councils without the framework of regional numbers and plans. Formal revocation of the RSS has not yet occurred and, in legal terms, the current RSS (East of England Plan) is still part of the development plan. National policy (including PPS12 & PPS3) also remains in force. Nevertheless, because the Government intends to abolish RSSs this becomes a material consideration in examining development plans. For this reason, it is necessary to defer, at the very least, the hearing session on housing (Matter 7) into the Castle Point Core Strategy until clarity is provided in a formal Ministerial statement. It may also be necessary to revisit matters where the consequences of abolishing the RSS could have some effect although there is no intention to do so at the moment. Should national or regional policy change, or the scope and nature of the examination alter as a result of new government statements, the agenda, nature and content of the matters and issues for examination may need to be further amended. In light of these changes hearing statements on housing matters should not be submitted until indicated by the Inspector. It remains to be seen how quickly the Coalition Government can act to prevent the previous government’s Regional Spatial Strategies from being adopted.